ANTIQUE TEXAS CITY MARSHAL BADGE. Stunning Texas City Marshal Badge with engraved Eagle and Star. Not for sale at this time. VINTAGE DALLAS TEXAS FIRE DEPT BADGE. ANTIQUE CHICAGO SPECIAL POLICE BADGE. ANTIQUE CLARK COUNTY LAS VEGAS NEVADA BADGE. ANTIQUE MCCOOK POICE CAPTAIN BADGE. DEPUTY SHERIFF SAWYER COUNTY BADGE. DEPUTY MARSHAL NORRIDGE ILLINOIS BADGE. CLARK CO. LAS VEGAS NEVADA DEPUTY SHERIFF BADGE. SOLID GOLD PORTLAND FIRE DEPT BADGE. MID-1800’S KANSAS CITY MISSOURI POLICE BADGE. SUGAR GROVE ILL. POLICE BADGE. DEPUTY SHERIFF WAYNE CO. NEW YORK. DEPUTY SHERIFF WAYNE COUNTY G.H. KIRCHNER BADGE. 24 KARAT SERGEANT MIAMI POLICE FLA. BADGE. ERIE COUNTY SPECIAL DEPUTY SHERIFF BADGE. DEPUTY SHERIFF WINNEBAGO CO. BADGE. RARE PERSONAL STAFF BAILIFF BADGE. JACKSON COUNTY MO. DEPUTY CONSTABLE BADGE. SHAWNEE COUNTY KANSAS DEPUTY SHERIFF BADGE. CITY POLICE FORT DODGE IA. BADGE. DEPUTY SHERIFF STEVENS CO. BADGE. ANTIQUE LAUREL CITY MARSHAL BADGE. CITY MARSHAL STATE OF IOWA BADGE. LINN CO. KANSAS DEPUTY SHERIFF BADGE. ANTIQUE SPECIAL DEPUTY SHERIFF DOUGLAS COUNTY NEB. ANTIQUE SPECIAL POLICE SPREAD WINGED EAGLE BADGE. OLD TOWN MARSHAL URBANDALE IOWA BADGE. DEPUTY MARSHAL STATE OF MICHIGAN. HONORARY JR. CLERK STATE SENATE BADGE. HUNTER TRADER TRAPPER COLUMBUS OHIO WATCH FOB. DRUG ENFORCEMENT BADGE & IMMIGRATION US SERVICE BUTTON. SPECIAL POLICE KANSAS CITY MISSOURI-1927. WICHITA, KANSAS U.S. POST OFFICE BADGE. 1800’s 6 POINTED CITY MARSHAL BADGE. U.S. POST OFFICE LETTER CARRIER BADGE. MISSOURI PACIFIC RAILROAD POLICE SPECIAL AGENT. OLD STATEN ISLAND RAPID TRANSIT RAILROAD POLICE SERGEANT. STERLING & GOLD GILT FORESTERS BADGE. ORANGE COUNTY HORTICULTURAL INSPECTOR CHIPRON STAMP CO. LOS ANGLES CALIFORNIA. OLD COPPER BRASS DEPUTY SHERIFF BADGE. SHERIFF’S POSSE JACKSON COUNTY BADGE. PITMAN NEW JERSEY FIREMAN BADGE. WATAUGA TEXAS CHIEF OF POLICE BADGE. UTE INDIAN TRIBE POLICE BADGE. VINTAGE POLICE BADGE CORBIN SCREW. SECURITY OFFICER ST. LOUIS MISSOURI BADGE. STERLING SILVER FIREMAN BADGE FRAZEYSBURG OHIO. DEPUTY JACKSON COUNTY MISSOURI BADGE. THE WM.J.BURNS INT’L DETECTIVE AGENCY BADGE. PRESQUE ISLE STATE OF MAINE BADGE. 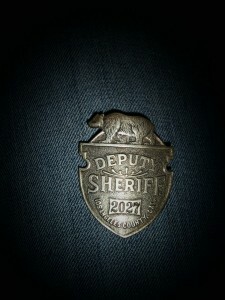 ANTIQUE DEPUTY SHERIFF CALIFORNIA BADGE. P.E COOPER CONSTABLE DOVER NEW JERSEY BADGE. ANTIQUE 6 POINTED STAR BADGE. Tintype photo of US Marshal wearing his 5 pointed star. On his badge you can see the US clearly. WEST VIRGINA EMERGENCY SQUAD HARRISON COUNTY BADGE. DEPUTY SHERIFF BRYAN CO. OKLAHOMA BADGE. RARE OKLAHOMA HIGHWAY PATROL TROOPER BADGE. SERGEANT DEPUTY CHOCTAW COUNTY OK BADGE. KANSAS CITY KANSAS POLICE BADGE 1. SECRUITY POLICE AIR FORCE BADGE. VINTAGE MISSOURI RAY COUNTY BADGE. VINTAGE NEW YORK LONG ISLAND BADGE. JACKSON COUNTY MO DEPUTY SHERIFF BADGE. VINTAGE DEPUTY SHERIFF BOONE COUNTY ILL. BADGE. W.S. DARLEY & CO. MAKER. RARE DEPUTY SHERIFF SAN FRANCISCO CA. BADGE. GOLD DEPUTY SHERIFF GREENE CO. MISSOURI. CAPTAIN SEDALIA MISSOURI POLICE BADGE. ARARAT TEMPLE KANSAS CITY MISSOURI BADGE. TEXAS RANGER CABINET CARD PHOTO. DEPUTY SHERIFF CLAY COUNTY ILL.
GOLD PLATED SPECIAL OFFICER BADGE. 1800’S POLICE INT’L FALLS MINN.BADGE. OLD TEXAS MOUNTED POLICE BADGE. Vintage Texas Mounted Police Sheriff Department badge. GOLD DEPUTY SHERIFF LEE SCHMIDT BADGE. 1890’S DEPUTY SHERIFF JASPER COUNTY MO.BADGE. DEPUTY SHERIFF JASPER COUNTY BADGE. Detective St.Louis Mo Badge PREDATES CIVIL WAR.